On 16 January 2019, Coral Methane successfully carried out her first liquefied natural gas (LNG) bunkering operation on the world’s first LNG-powered cruise ship at Santa Cruz de Tenerife in the Canary Islands. 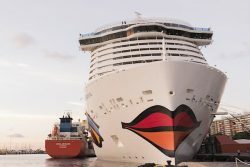 She fueled AIDAnova, the newest ship from AIDA Cruises, which made history as the cruise industry’s first ship to be powered at sea and in port by the world’s cleanest burning fossil fuel. Coral Methane is a 7,500 cbm vessel that has been modified from an ethylene/LNG carrier to an LNG bunker vessel for Shell, who are supplying the LNG. Carnival Corporation & plc, the world’s largest leisure travel company, will bring seven more LNG-powered cruise ships into operation by end of 2022.